The most essential action you can do when viewing and, soon after, celebrating Ocean’s 8 is to remove the proclivity of gender labels. Plenty of people are going to dive right to the big-name cast and start tagging their statements with “all-female” or “women-centered” qualifiers, or worse with “chick flick” branding, in front of what it really is and was always meant to be. Gary Ross’s film is a proper heist movie, plain and simple. LESSON #1: LET SOMETHING FUN BE FUN — Let Ocean’s 8 be marvelous for what it is and not curved by who is in it and which chromosomes they have. When someone adds the marginalizing and labeling descriptors, their narrow vision becomes part of the problem. That goes both ways. Not every film for or including women has to carry a torch and a battering ram. 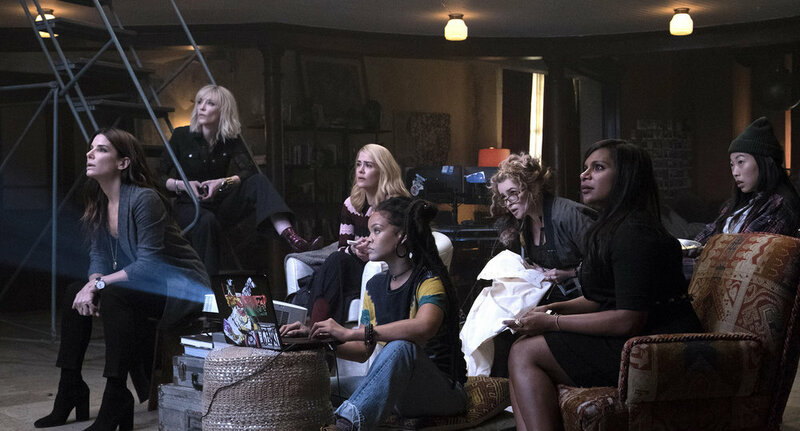 The only #MeToo aspect about this Ocean’s 8 is the equal capability to impress, show off, and look good doing it. These ladies do it no more garishly than a bunch of men did 17, 14, and 11 years ago. Read this cast interview and the stars of Ocean’s 8 will tell you the same thing. See how they’re tired of the same silly questions that imply something like this can’t be enjoyment first and foremost. After you shuck those temptations, feel free to call Ocean’s 8 a well-garnished cinematic martini. Plenty clever and cool in its own right, the summer tentpole is a highly enjoyable little diversion of escapism, true to its intent and design. Like the classic cocktail, this very entertaining romp combines the strong and the sweet with plenty of little twists. Sandra Bullock leads a dynamite and diverse cast as Debbie Ocean, an ace shoplifter, grifter, and the younger sister of Danny Ocean. She has just been released from a five-year jail sentence in New Jersey after being pinched in a scam while in a working and romantic relationship with Claude Beckett, an up-and-coming painter played by Richard Armitage of The Hobbit trilogy. True to her family blood, Debbie spent her time masterminding a job while in the clink. Her ingenious plan is to swipe a multi-million dollar Cartier necklace at the prestigious annual Met Gala, a signature scheme of intrigue, flair, and dollar signs her longtime partner Lou (a platinum-banged Cate Blanchett) can’t say no to. The two assemble the ideal team to infiltrate the extremely exclusive event underneath the blanketed surveillance of one of the most secure museums in the world. That brings in the hacker Nine Ball (Grammy winner Rihanna), the jewelry maker Amita (comedienne Mindy Kaling), the energetic young thief Constance (multi-talented performer Awkwafina), and the housewife fence of Tammy (Sarah Paulson). The marked neck wearing the valuable necklace will be A-list actress Daphne Kluger (Anne Hathaway, essentially playing a vain gum-chewing version of what people probably think of her), and Debbie’s way in is indebted fashion designer Rose Weil (Helena Bonham Carter) picked with the honor of dressing the star for the big event. LESSON #2: TEAM BUILDING IS IMPORTANT — This is about chemistry, skill, and commitment to up for a challenge. Every player has a key role and responsibility. If not, then each individual has a leverage point or stake that gets them in the game. It all has to gel right, because every entangled party or mark has a karmic thing coming to them. After opening with the problematic gender debate, let’s close with an equally tricky pitfall of expectations within the movie landscape. Ocean’s 8 is a spin-off extension and not a reboot to the Ocean’s franchise. That means comparisons, whether they are fair or not, will be pointed towards Steven Soderbergh’s previous trilogy. Go easy on that. LESSON #3: LET SOMETHING BE ITS OWN THING — This too is a place where avoiding comparison would be best in order to let this film be its own thing. Where you can, try not to immediate rank or pigeon-hole this film in shallow ways. For example, don’t assign these ladies the “Brad Pitt part” or likewise with the original George Clooney-led crew. They are each their own entities and different archetypes. Start there and then do the same thing with the different director, writer, and other artists involved. If you were expecting heavy lifting from the likes of Oscar winners Sandra Bullock, Cate Blanchett, Anne Hathaway, two-time nominee Helena Bonham Carter, and Emmy winner Sarah Paulson, you came to the wrong place and brought the wrong scorecard. The only flexing necessary was their easy ability to embody a team of female characters that are confident and supportive of each other. Performing within that teamwork with panache and comic timing, none of these actresses are a weak link here and no one is really a scene-stealing surprise either. Maybe the film needed one upstart to a degree for an extra must-see draw. A fair objective comparison is how the heist plot structure and pacing of Ocean’s 8 is virtually identical to the other films in the franchise. All Ocean’s films employ a lengthy preparation introduction of shorthand character development leading to an expansive central crime that peaks earlier than the end to allow a extended how-did-they-do-that denouement and resolution. It has become a tried and true formula that even Soderbergh himself still uses outside of the franchise with last summer’s Logan Lucky. Call that a confine and call that a requirement all the same. Done right, the blueprint still entertains plenty. This one is written by director and four-time Academy Award-nominee Gary Ross (Big, Seabiscuit, Pleasantville, The Hunger Games) and emerging screenwriter Olivia Milch (her second feature after the recent Netflix film Dude, which also featured Awkwafina). Sure, Ross does not have the same jazzy style of Soderbergh but enough dexterity is there with Daniel Pemberton’s bouncy modern score and a well-choreographed plot of reveals and swerves. Breezy with winking delight all along the way, Ocean’s 8 lacks a true heavy or power protagonist to pose a real threat, making this heist a little too easy and lacking a jolt of potential peril. LESSON #4: THE SATISFACTION OF A JOB WELL DONE — That said, the pizzazz and cool factor are entirely intact with Ocean’s 8. These ladies are thumbing their Robin Hood-like noses at the tropes of decadence and opulence on display because they are exploitable and they can. In the end, this is more about the thrills of the score than the frills of the materialism within the robbers’ cross-hairs. The caper and the movie bring that convenient and competent fulfillment.